We are so excited and proud to carry this incredible Cling On brush line for all your painting needs. 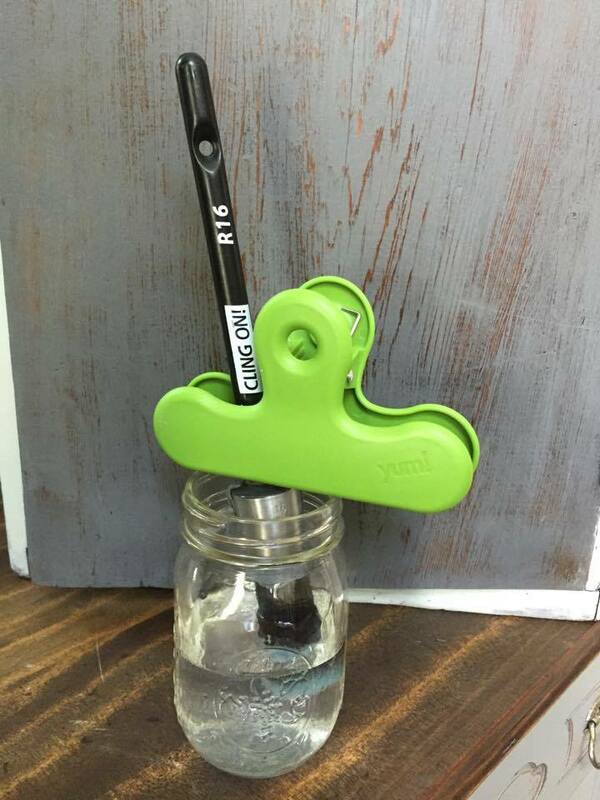 You’ll never want to use another brush again. Enjoy using less paint, finishes free of brush strokes, and a self-cleaning brush that will last you for years. Get its “feet” wet by using the brush a little wet instead of dry and store in water between jobs. For more tips and reasons why this is the best brush on the market, read the blog post below by Karen Chouinard. Ever wonder what is so great about Cling On Paint Brushes? You will find a brush for all projects in the Cling on line. 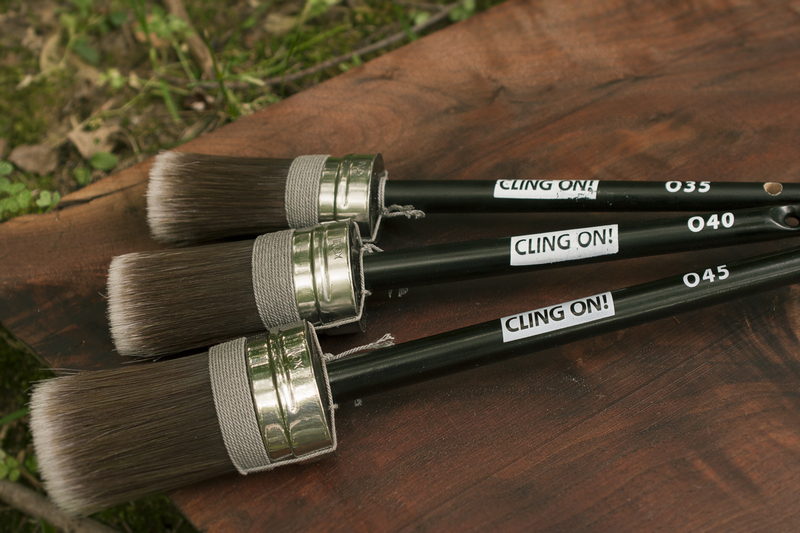 The Cling On Brushes come in the following sizes and styles. Let your bristles absorb some water prior to use. Some say, let your brush “Get its feet wet”. -Do not remove the attached strings present on the round and oval styles. They help preserve shape retention of brush. Try to keep from dipping the brush up to the strings to preserve the life and make brush cleanup easier. -Lightly wring out or spin brush handle between hands to remove excess water prior to use. -Store your brush in water when not in use. A little water in the bottom of a mason jar and a chip clip attached to the handle to keep bristles suspended, will provide an excellent home for your brush and make cleanup a breeze. -Dip the tips of bristles in a little water while painting if the paint seems to be drying on the bristles. This is especially useful while working outdoors and will help promote the flawless brush stroke free finish. Hard to reach places and inside hutches: Angled medium or Large- P20 or P24. O Series/Oval Styles, ideal for all over painting and great for painting legs and spindles as well as any detailed areas. 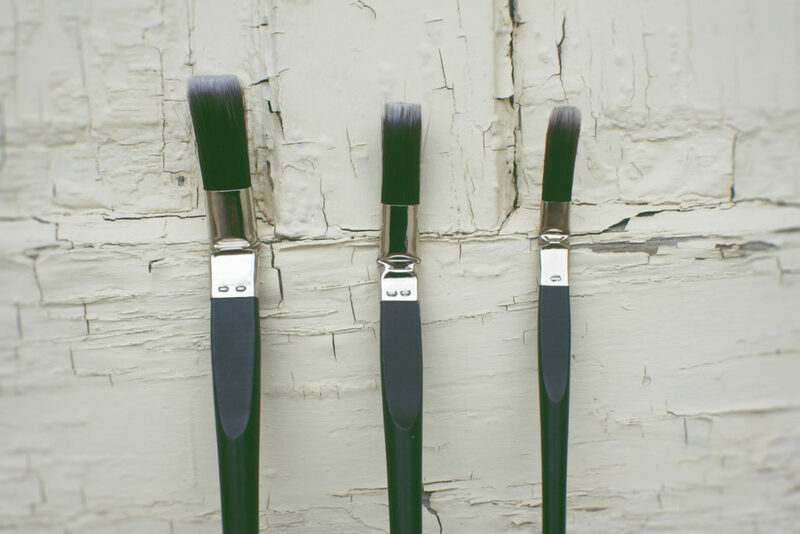 The O40 is the bestselling Cling On brush and the O45 is a favorite among cabinet painters. R Series/Round Brush Styles, ideal for all over painting and produce a similar finish to oval brushes but I find the Oval Brushes make for quicker painting but the round styles are best suited for more detailed areas. These will make quick work of painting banisters, spindles and more. The R12 is the perfect brush for small projects like jewelry boxes or photo frames. F Series/Flat Styles, ideal for large surface painting and more. Some painters just prefer a flat brush for all applications and it’s all a matter of personal style and finding what works for you. The large is wonderful for stain and poly applications in addition to painting. I found, when working alongside my husband staining our deck, that the Cling On brush was wonderful for more than just paint. The areas I applied the finish with my F50 Cling on were flawless compared to the streaky finish produced from the large natural bristle brush that the “stain experts” recommended he use. The flat styles are also useful for cabinet painting and more flat surfaces. P Series/Angled Styles are ideal for all of those tricky areas. I get the most questions about this style. “What are those funky angled ones for?” Once you have used them to reach that area that you couldn’t get to, then you will truly understand their value! They are ideal for pieces like hutches or on the interior of pieces, and for painting under arms of a chair, under a horizontal spindle, and areas that you cannot fit a traditional brush. They aren’t suitable for painting an entire project as they are smaller sizes but you will find many times that you could use one! B12 Block Brush: This giant 130mm block brush is ideal for applying poly, stain, varnish, color washes, and painting walls. This is one mammoth block brush and believe me, you will find it useful on large projects! I used mine to stain my deck!